Searching for a way to dramatically change up your look without spending a lot of time and money at the salon? Our versatile hair pieces transform your style in seconds, making it simple to achieve the perfect ponytail, braid, or updo. Choose from bun hair pieces, clip in bangs, pony wraps, hair scrunchies, hair headbands, ponytail extensions and more for special occasions or everyday wear. There are lots of reasons to consider investing in a hair piece—or even more than one! These versatile additions to your beauty arsenal make it incredibly easy to achieve a wide variety of hair styles that might not be possible with your natural hair. Well-made hair pieces work with your own hair to provide hundreds of creative styling options, from dramatic updos for formal events to everyday ponytails with extra bounce. You can use hair pieces as test runs for permanent changes to your haircut, to amp up your beauty routine for special occasions, or simply to have a little fun with your everyday look. A new hair cut or style can be a big investment—and sometimes a scary possibility! Hair pieces are a fantastic way to test out a different look before taking the plunge. You can use clip in bangs to find the right cut for your face shape, and try out ponytail extensions or hair headbands to see if more permanent extensions are the right fit for you. Updo hair pieces are a fantastic way to get a look with serious wow factor for big events, too. If you’re headed to a gala, attending a wedding, or have plans that will put you in the spotlight, updo wigs give you the look of a salon-quality style at home. Hair pieces are an especially great option if you prefer to keep your natural hair short; you can have any hair style and length in a snap, while keeping your own cut short and easy! When it comes to choosing updo wigs, you’ll want to start by finding the perfect match for your hair color. A seamless blend is key for making the style look natural and chic. Unsure how to find your color? 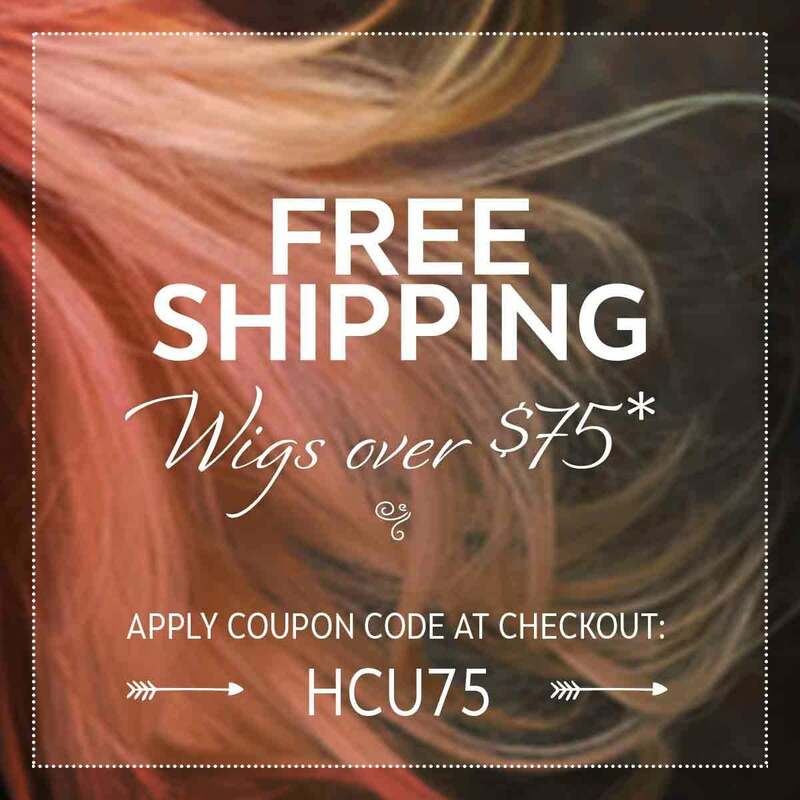 Our expert wig consultants are here to help! You can send a swatch of your own hair, take a reference photo, consult a color ring, or use one of several other methods to find a hair piece in the perfect shade. Once you’ve found the right color, have fun with your look! Select a hair piece based on your lifestyle and the occasion at hand. You might choose a hair piece bun for a chic office look, ponytail extensions for a modern day-to-evening style, or a hair headband to pump up the volume when you wear your hair down. If wedding bells are ringing in your future, you’ve probably spent a lot of time thinking about the perfect ‘do for your big day. Extensions, hair wraps, and clip-in bangs can help you achieve the wedding hair of your dreams, adding luxurious length and volume that will make you stand out as the bride. You can also use hair pieces to reduce the stress of growing out your own hair pre-wedding; there’s no need to worry about having the length or volume you need for the style you desire! Because you generally don’t wear them on a daily basis, hair pieces can last for a long time with proper care. For best results, store your extensions and other hair pieces flat in a box when you’re not using them; make sure they’re clean, dry, and free of tangles before stowing them away. It’s also important to avoid sleeping in your hair pieces, so be sure to remove and store them properly after your big event (luckily, that takes just minutes!). Here are more tips for washing, brushing, and storing your hair pieces to make sure they stay in top condition long-term. When choosing a new hair piece, the most important thing to remember is to have fun! Our hair pieces are designed to help you achieve the style of your dreams for a special occasion, or have fun experimenting with new everyday looks. Ready to take the plunge and up your hair game? Our customer care experts are here to help with any questions or concerns! Call us at 1-800-264-4287 (HATS).